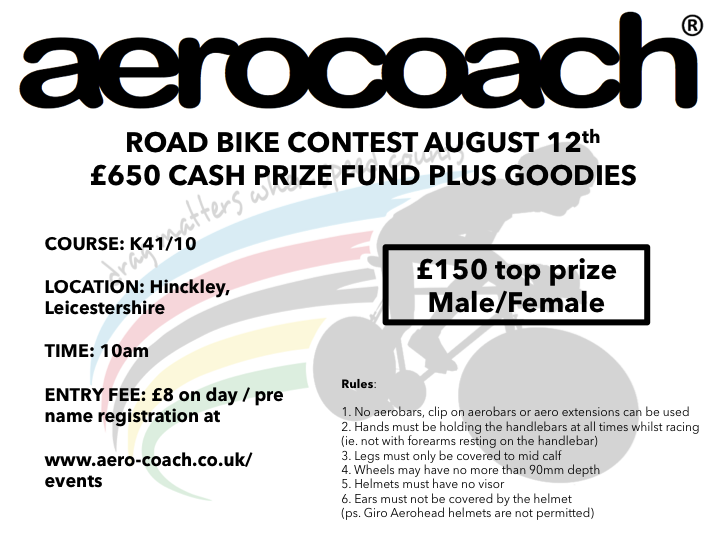 The AeroCoach Road Bike Contest is a CTT Type B event taking place on the K41/10 10 mile course in Hinckley, Leicestershire. The race starts at 10am, with sign on at 9am. Using road bike rules there are big cash prizes to be won for both individuals and teams! In addition, the use of a Giro Aerohead helmet will not be permitted. There will be spotters out on course to enforce rule 2. After filling in the name registration form below you will receive an email before the day with final information. Prizes will be given out immediately following the final riders. There may be limited spaces available on the day, please check this page for final updates!